The Brazil-Thailand Chamber of Commerce (BTCC) specializes in developing commercial relations between Brazilian member companies and Thai member companies planning to enter the Brazilian or the Thai market for sales of their products and/or for manufacturing in Brazil or Thailand. The BTCC assists member companies in all aspects of direct investment in Brazil or Thailand by matching the member company with Brazilian or Thai firms in search of capital and partners. 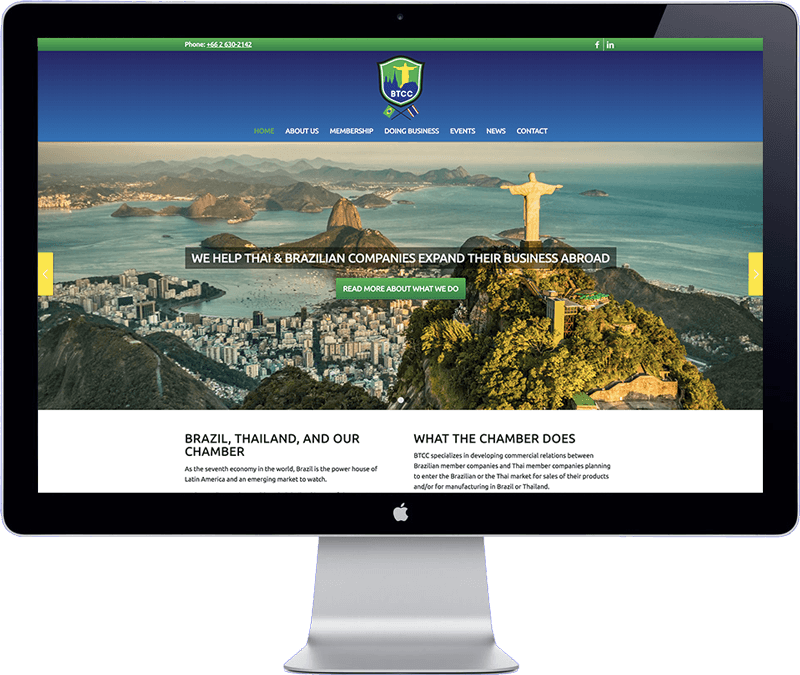 The website informs visitors about the Brazil-Thailand Chamber of Commerce, a membership and newsletter sign up section, a news page, links to their social media channels and a contact form. The website is easy to updated, looks great on desktop, tablet and phones, is optimized for search engines (SEO) and loads fast and is secure. The website has been developed with WordPress Content Management System. The customer received training on how to update the website over Skype.